The views expressed here are my own views and not that of CSIRO or DIGO. I have had no involvement with the development of the Sentinel technology and do not represent CSIRO or DIGO in any way. 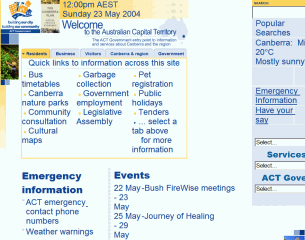 In January 2003 a state of emergency was declared in Canberra, Australia's capital city. Fire destroyed more than four hundred houses and claimed four lives. 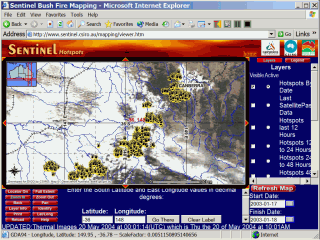 One of the emergency systems overloaded by the magnitude of the disaster was a web based application used by to track the fires by satellite. The author will talk about how observed the developing crisis from his home office and followed how the system coped and was improved to deal with the unexpected demand. New research being conducted in Canberra on high bandwidth application and digital video will be discussed and how it could be used to cope with natural disasters and other threats, such as terrorism. This talk is intended to give a more personal account of what happened and suggest action by government, industry and the IT profession to better respond to such emergencies. The Internet will cope with emergencies. Web sites for important public information can be built to cope with emergencies. New new Internet technologies may be suitable for use for emergency services. It is normally assumed that the Internet is a fragile infrastructure and cannot be relied on in an emergency. However, experience shows this is not the case. There was an assumption by some in the media that the crash of aircraft into the World Trade Centre in the USA has caused the Internet to stop functioning. The Internet worldwide noticed only a few minutes of slowdown. Some news web sites were overloaded, which can be addressed with better web design. On the afternoon of 18 January 2003, a state of emergency was declared in Canberra, Australia's capital city. Fire destroyed more than four hundred houses and claimed four lives. As a resident of Canberra I was one of those caught up in events, who looked around for information about what was happening and what to do. Like most of Canberra on that day, I was concerned about the fires, but by their common Australian name these were "bush fires" in the bush around Canberra and therefore not a threat to the urban area. The 18 th of January was a Saturday and I went to the public library at Belconnen, Canberra's North West satellite town. While sitting reading a book I recall hearing two announcements over the library public address system. These asked residents in a list of suburbs threatened by fire to go home and secure their houses. Like many in the library I thought little of this, these were obviously houses on the fringe of the city. Then was a third and final announcement that a state of emergency had been declared, the library was being evacuated and everyone was to leave NOW. It was the tone of the announcement which drove us out of the building, as much as the content of the message. I did not realise how much this effected me until many months later, when on another Saturday afternoon in the library the PA system was activated. This was just for a routine announcement, but I had a momentary sense of panic, recalling 18 January. On the afternoon of 18 January I stepped out of the library after being ordered to evacuate, to what first appeared a normal sunny Canberra afternoon, with a crystal blue sky and a few fluffy white clouds. But looking to the south, half the sky was covered in a thick black-brown cloud. This didn't look like smoke, but like the largest thunderstorm I had ever see. I took a photograph from the car park and wondered what to do next. Friends with a small child lived nearby and it seemed best to go there and see if I could help. I then spent an hour or so helping clear flammable material from around the building, trying to convince the householder to come down off the roof (where he was clearing the gutters) before he fell off. I later I learnt that one of Canberra's IT professionals had fallen off the roof of his house and broken a foot. All the time we had the radio tuned to ABC Radio 666 which had suspended normal programming and was working out on air how to be an emergency information service. All this time helicopter water bombers were circling overhead. This was both reassuring, but also worrying, as it indicated that there must be a fire nearby. One of the problems with a fire is that from ground level it is very difficult to see where it is. There was little more I could do at the friends hose, so I drove home. On the was I saw a stream of helicopters dropping water of a fire in North Belconnen. Then I went home and wondered what to do. ABC Radio was broadcasting calls for assistance with goods and services, but there seemed little I could offer for the emergency. It seemed reasonable that some form of information service and coordination would be needed. So I checked the ACT Government web site to see what was available. The ACT Emergency Services Bureau has issued the declaration of the state of emergency on their web site, but there was no direct link to this, or to other emergency information from the ACT Government home page. 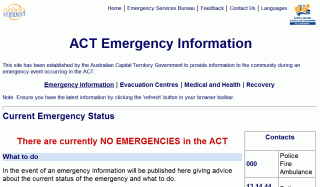 ACT Chief Minister, has declared a state of emergency in the ACT. Powers of control have been given to Peter Lucas-Smith, Alternative Territory Controller. 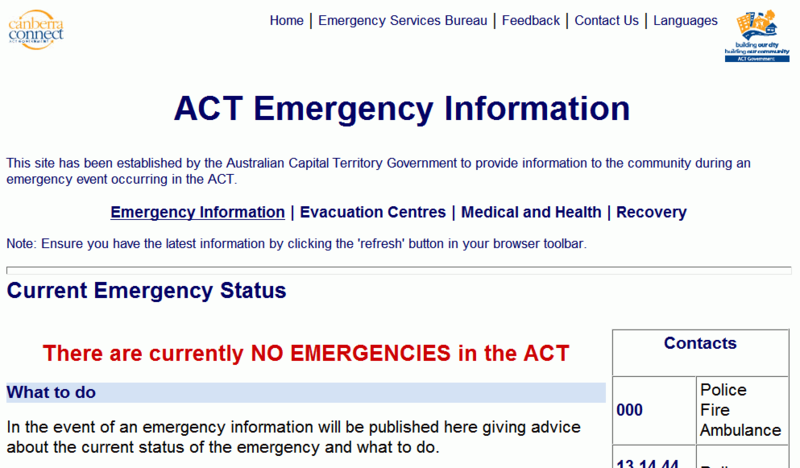 A direct link from the ACT Government home page to the emergency web site, was added shortly afterward. Over the next few days the ACT Emergency Services Bureau showed good web design skills in evolving their web site in a low text fashion. As information became available it was added to the emergency services page. This was not very pretty, but appropriate to the task. ABC 666 also provided a useful service with their web site. Canberra's fire emergency has claimed one life and up to 100 homes, with two dozen suburbs still considered in danger. 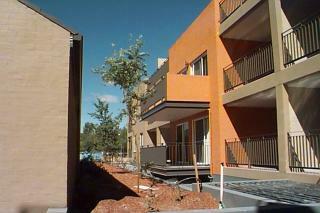 In 2001 I purchased an apartment in the new "City Edge" development in O'Connor, an inner north Canberra suburb. The building was equipped with a broadband fibre optic cable to the basement, serviced by Transact (a Canberra based broadband service provider). So I decided to set up the apartment as a usable but hi-technology showcase "Smart Apartment. Rather than an expensive and inflexible built in home office I decided to have a portable one. This simply consists of my laptop computer on the dining table and plugged into the set top box. This is similar to the deployable military headquarters I looked at while at the Defence Department. 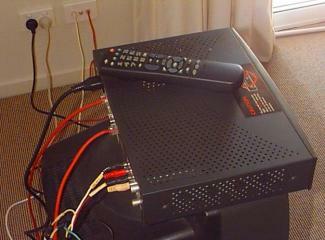 With this arrangement a bare room is supplied with power and telecommunications. The personnel arrive with their laptop computers and plug them in. Because while the rest of the complex was being constructed the builders would occasionally cut off the power to my apartment I purchased a $300 UPS to run the set top box. This turned out useful in the bush fires. At one stage the emergency descended into a dangerous farce. ABC Radio reported that mains power had been lost to the emergency centre. Fires had effected the power lines across Canberra, causing blackouts and brownouts. The centre's backup generator failed to start. While this was happening and throughout the emergency, my home office was unaffected. 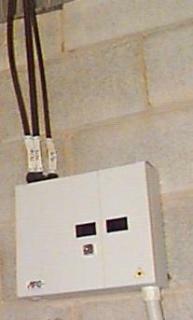 During short blackouts and brownouts the UPS automatically took over supplying power to the set top box, providing continuous broadband access from a fibre optic cable in the basement. My laptop computer continued to run from battery. Internet and web services were unaffected by the fires, as the telephone (also supplied via Transact). It is usually assumed that emergency services need special ruggedized and ultra reliable equipment. While such equipment is available, it is expensive. Even the military now use commercial off the shelf equipment where they can. This would seem to be suitable for the administration of civilian emergency services, for businesses which need to provide services in an emergency and, to a limited extent, for the general public. 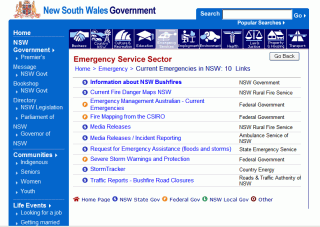 Rather than leading to a NSW Emergency Page (as in the ACT case), the NSW Portal links to a list of emergency related agencies and information. 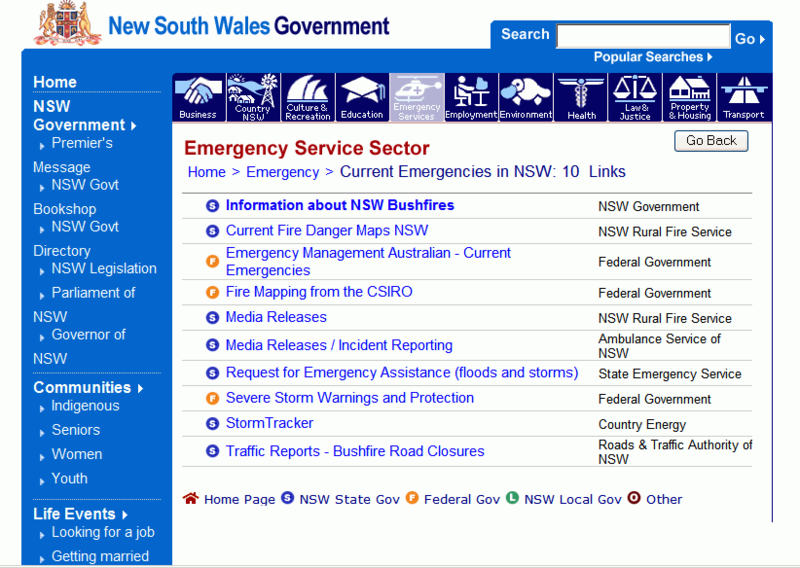 The link from there to "bushfires" brings up a further list of Federal and NSW state government agencies. 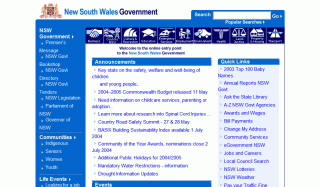 Selecting the first link in the list when using the Opera web browser, produced the incorrect and potentially dangerously misleading message "You are now leaving the NSW Government web site". A reader looking for official NSW Government information is may stop at this point and look elsewhere. 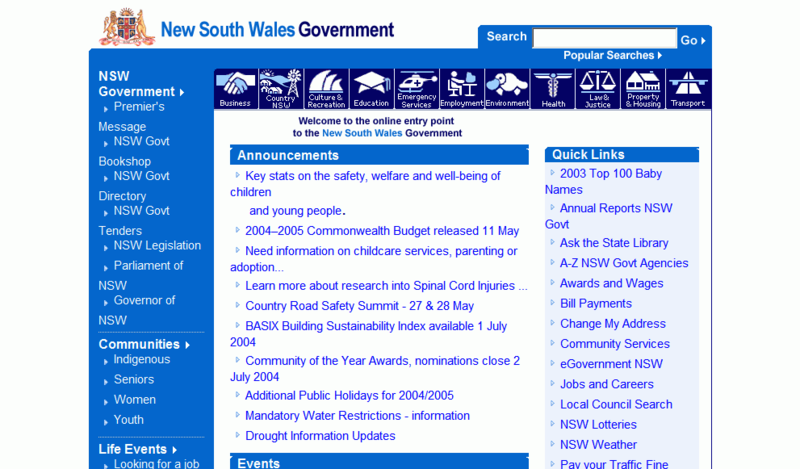 As it is there appears to be no clear central web site for current emergency information for the NSW Government. 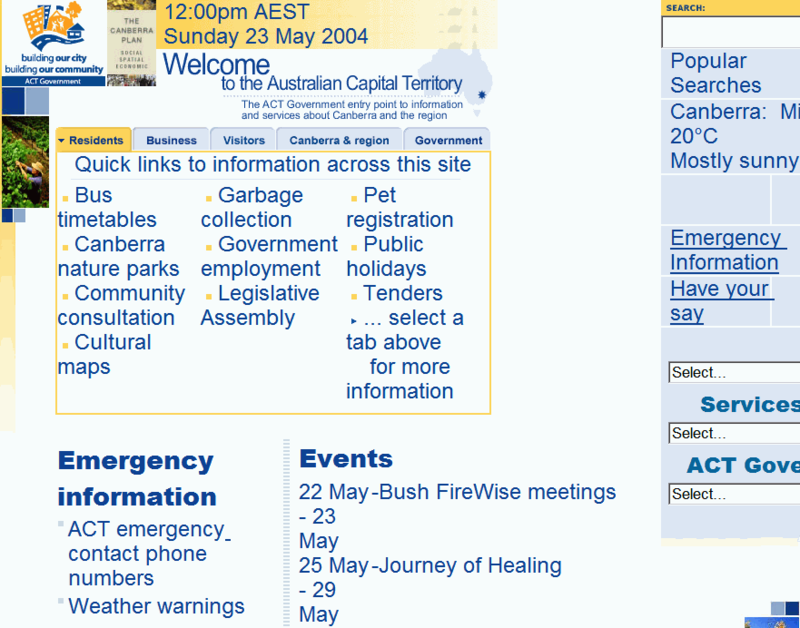 While the ACT Government web site continued to operate during the fires, there were problems with providing information on-line. Also there were previous lessons from September 11, 2001 which are applicable. 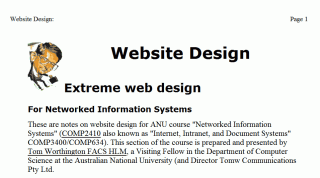 I have been teaching these to ANU Web Site Design students. 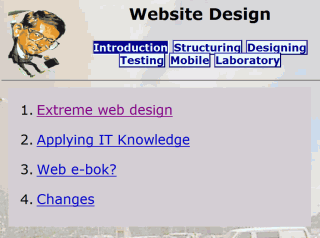 Before modifying or creating a web site for emergency use, keep in mind the limitations of the web. 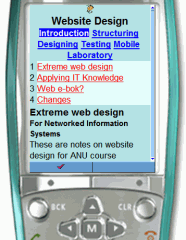 To view a web site the user requires a working computer, with electrical power and an Internet connection. 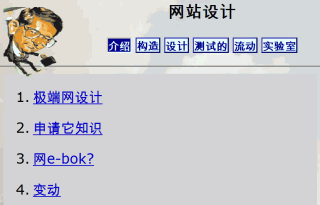 Also the user needs to know that there is useful information on the web, where and when to find it. Other information services, such as telephone, e-mail, facsimile and radio may be more effective for immediate communication. However, you can provide a web address, for example in a radio broadcast or a mail message to a predefined list, to provide more detailed information. Overloaded system: The major challenge in an emergency is the overloading of web servers from too many requests. Generally the Internet itself copes well, it is just that specific servers have too many requests on them. Don't know where the information is: Users may not know where to look on the web for the information they require. Australian scientists have joined forces with Defence, CSIRO and Geoscience Australia to develop an online bushfire map that will help fire fighters better detect and monitor blazes that threaten lives and property this bushfire season. The Sentinel Hotspots system was launched today. It is online at http://www.sentinel.csiro.au. This service was created for the general public good and accordingly the web address of the live system was provided in the announcement and the public was invited to use it. As a result of the fire crisis the system became overloaded. The system administrators placed a message on the front page requesting that the general public refrain from using the system, to allow access for fire-fighters, but it was clear that the system was still overloaded. As discussed below, some simple changes to the way such systems are designed would allow them to be used from wireless hand-held devices and on wall sized screens. The Grid: Future for Emergency Use? Grid computing is a form of distributed computing that involves coordinating and sharing computing, application, data, storage, or network resources across dynamic and geographically dispersed organizations. Grid technologies promise to change the way organizations tackle complex computational problems. However, the vision of large scale resource sharing is not yet a reality in many areas - Grid computing is an evolving area of computing, where standards and technology are still being developed to enable this new paradigm. For emergency purposes, more interesting that the Grid's computing capacity is its use for collaboration. Accompanying software tools for networking are those for building standardised high bandwidth videoconferencing rooms, called access grid nodes. 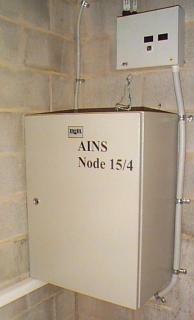 The software and documentation for building an access grid node can be downloaded free from the Internet. An access grid differs from commercial videoconferencing in using high resolution services (for example a minimum of 3072x768 shared pixel display screen) and reliance on Internet networking. 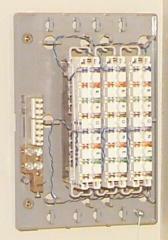 However, it is possible to interface low bandwidth and commercial video conferencing systems to the access grid nodes. More than a dozen Access Grid nodes are being built in Australian universities. These could be used by emergency service personnel to trial the facilities. The experience from these could be used to build access grid nodes into emergency situation rooms, to produce transportable units to be installed in temporary rooms as required. Note: 3 nodes are being designed - one in Leonard Huxley Building, one in CS&IT building, and one at Mt Stromlo Observatory. Also: Chinese, French, German, Italian, Japanese, Korean, Portuguese or Spanish. As the text of all versions is in the one document, it can be easily transformed, as for example by machine translation into other languages. Here is what the slides look like when translated from the English language into Chinese using the AltaVista Babel Fish Translation Service. The translation is only approximate. A by-product of this design approach is that these pages are ideal for emergencies, as they use little bandwidth and are easier to read in a stressful situation. They can also be used with hand-held devices used by emergency personnel in the field. The same web pages can also be made to automatically adapt to display on a high resolution Access Grid screen in an emergency centre. Further work could refine the technique.